You see, I love vinyl, as in, vinyl records. Albums. Recordings of music. Any true audiophile knows there is no better sound quality and nothing tops the feeling of putting needle to surface and spinning that black circle. When Magic Hat released this beer last year, I was quite excited to combine two things I truly love, beer and vinyl. Vinyl (the beer) is an amber lager brewed with a larger strain of yeast and fermented at lower temperatures in order to allow the beer to achieve an easy-drinking sweet characteristic. Supposedly, this seasonal is to be available from April 1 – July 31, but I obtained a few bottles on January 23 and decided to review this second-year batch. My pour delivered an above-average but not large head which wasn’t quick to disappear. It was creamy in texture and the beer itself was a sweet tea amber color that was hazy with a glow. There was a touch of sediment swirling in the bottom of the glass and lacing throughout was excellent. Vinyl is a great looking beer. The aromatics weren’t as great as the visual. There was a light floral aroma present, paired with a hint of toasted caramel, which gave a somewhat earthy flare. I noticed a chalky scent present, which wasn’t a good thing, and it kind of dominated over the actual legitimate aromas. But the biggest thing was all the aromatics were hard to find — I really had to think to assign some scents. Thankfully, the flavors weren’t hidden. The palate was met with a blast of malts that were toasty and crisp. Immediately I got a hint of caramel and coffee, which were pleasant together and the finish was floral with a citrus note in the background. The middle? I don’t know — Vinyl falls apart in the middle. There’s a really strong initial bang of flavors, then it dies like a flat soda, then you get the floral/citrus finish of medium length and average carbonation. The mouthfeel on Vinyl was quite unique; the only term I could use to describe it would be crisp. In terms of how it felt to my tongue, this is more of a fall beer than a thawing spring drink. Overall, I continue to be disappointed with offerings from Magic Hat. 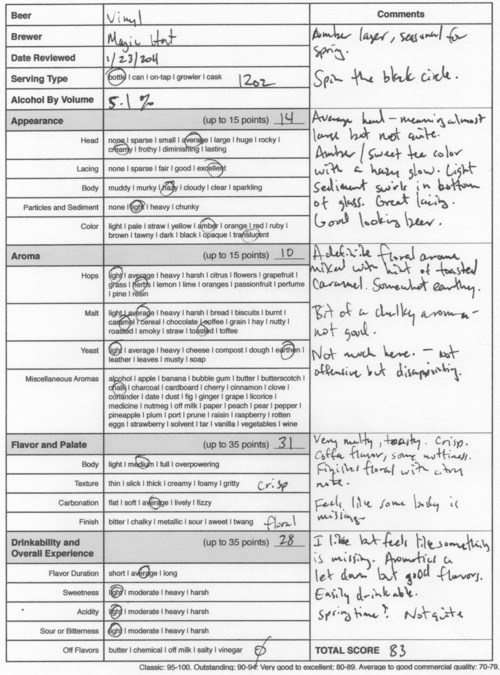 (I rated Encore, part of their IPA seasonal series, 74 points.) Discounting the aromatics, I found Vinyl to be missing some body, almost as if the beer were somewhat watered down. The flavors that were there were good, but there was something in the middle that didn’t glue this one together. With a little flavor tweaking, this could be a hit. And, for the life of me, I just can’t find anything springtime about it. Breaking Vinyl down, I gave it 14 points in the appearance category, noting its excellent color and lacing. The aroma got 10 points, picking back up with a 31 in flavor and 28 points overall. Magic Hat Vinyl, 83 points. Price: $7.99 US for six pack. Jim Pollock, renowned hard rock poster artist, designed the packaging and bottle art for this beer.